So, fellow educators, what do you do to create flow in your classroom? If it's games-based, all the better! By the way, don't fall into the assumption that "games-based" always means "digital games-based". Or, just go ahead and use this forum to brainstorm! How do you encourage flow in the classroom in your subject? Why did I pick flow? Because, for me, it seems to be the most difficult to create. Fiero, I think, stems from flow. Fun is something we all seem to understand, but flow...how do we get that going? Ideas? Later edit: The more attentive souls around here may notice I asked the same in the other thread in this forum. I thought that I'd like to pull in some additional points of view from others who are not in that thread. Feel free to post in either place, of course! Building on that "teachable moment" where everyone is so involved they don't feel like they are being taught, they are in the zone. I have done this both ways: using the teachable moment and then introducing a game but I've also introduced a game and extended the learning. I wish we had more spontaneous moments but I find that planning ahead of time helps a lot. We do use some digital games, like Minecraft or Grepolis (sp), but our favorites are board games, card and dice games, things like that. The kids even make up their own games based on the games we have! My favorite example is the game Geodice. All three boys enjoyed playing it but the youngest had a hard time with reading some of the text. The next day they played their own version of Geodice at the wall map, using some of the same rules but modifying for their own level. They began asking about the different countries they were seeing on the map, which prompted opening up Google Earth and exploring through that technology. I managed to pull it back around to the historical narratives we had been reading, tying it all up nicely! I know that we have more freedom in our classroom because we homeschool, but bringing in that idea of being intensely focused is still important and doesn't happen as often as I would like. Great points! I guess part of teaching to encourage flow is preparing ahead of time and having a sense of timing, then. I've noticed that if I give my students a task that centers on what we're learning that is somewhat repetitive, they'll often get into the "zone" while practicing what we just learned. Other suggestions? Also, what do teachers do that pull students out of their zone accidentally? In my 9 or so weeks of student teaching, the one activity that created Flow was a lesson utilizing Kelly Gallagher's Article of the Week. It was not a game. 1) Read article silently, marking up the text with questions and thoughts. I think it created Flow, first of all, because of the novelty of what we read - the subject matter (child cured of AIDS) was completely "foreign" to a Latin class. Secondly, I think they became "invested," and then were able to look for Greek/Latin roots without it being "boring." I think student autonomy is a big contributor to flow. 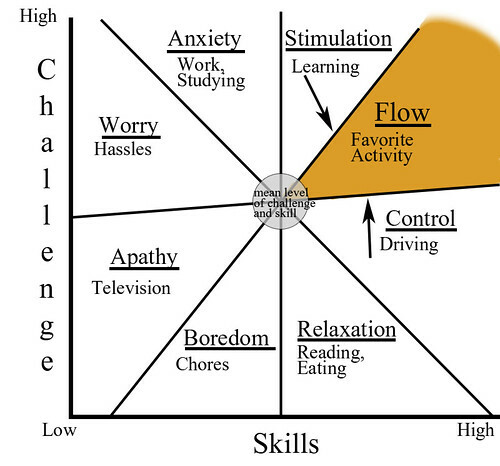 If students are truly interested in what they are doing, they're more likely to experience flow. Also, I think that if they're having fun, even if they don't necessarily like or have an intrinsic motivation for the topic being addressed, they may experience serendipitous flow. In truth, though, I think all flow is serendipitous. There are so many factors that have to be present all at the same/right moment. For example, the other day in my FYC class, the students were role playing in Second Life. The students have adopted a specific role for the semester (criminal investigator, psychologist, journalist, etc.). They've written backstories for their personas, created Google accounts and profiles, blogs, and SL avatars. Each week, they meet with each other in SL to discuss their "cases" for the week (the short stories and plays we're reading as part of the intro. to lit. component of the course). Each group meets in a location applicable to their role (the investigators meet in a pathology lab, etc.) and my character teleports back and forth between groups giving feedback and asking probing questions. The other day, the groups were discussing the play Trifles, which involves a woman in a small rural community who has apparently murdered her husband, who may have been abusing her (it's based on a real case from the early 20th century). The investigators were having a lot of trouble analyzing the "case" and were really struggling with motive. One investigator asked if they could visit the psychologists and get their insight into the accused's motive and mental condition. I shared the landmark and the entire group of investigators teleported to the psychologists' island and began asking them questions. The psychologists seemed so proud that they were able to add insight into the case. We were all just so immersed in discussing the case and, before any of us even realized it, class had officially been over for 10 minutes. The students seemed reluctant to leave SL because it was so disruptive for us to have to break the flow we were in. I could never in a million years have planned that moment of flow. If I had been the one to suggest that the two groups collaborate, I am certain it would not have led to such an engaging conversation. But the students were involved in a problem that interested them but they couldn't quite figure out (hard fun) and they felt comfortable asking to collaborate with one another (autonomy). I also think that, because they were in SL, they felt much more comfortable talking with another and admitting their initial failure. After all, it was their character's failure, not necessarily theirs. 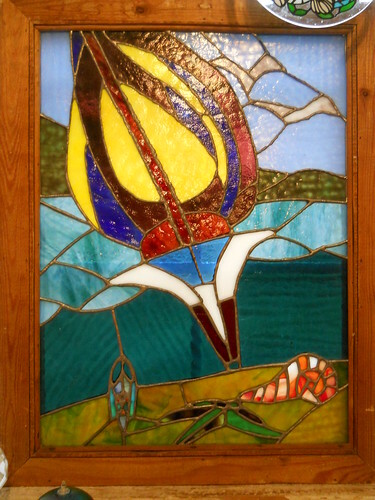 Well I am trying for flow in my class, gave it a test run on Facebook, I have a new stained glass, very old, probably 1880-1930 and I don't understand or can't identify all the symbolism, think it came out of a church. So put it up and asked for help. Toady in my Anthropology of Religion class, which is Face-to-Face and in a computer room, they are to take about 15 minutes and try to identify the different symbols and then figure out what they mean, by the way in the left hand lower corner that is a devil's head I am sure with tiny RED burning eyes and mouth when the sun comes through it... rather scary. So go with the flow... help me out. I could never in a million years have planned that moment of flow. You may not have planned for it intentionally but by introducing the story about how the real police asked for the psychologists help was probably an unconscious nudge to the students to do the same thing. And by creating such an immersive and interesting way to look at literature, you brought a new dimensionality to what could have been for many students very dry. That being said, you can plan all you want but you will never really know what might spark that moment of flow for students. That's why you were the important piece of that learning experience: you came in with just the right info at just the right time to make it flow for them and then create fiero (at least that's what it seems to me). that idea of being intensely focused is still important and doesn't happen as often as I would like. First off how can you ever create a flow lecturing to 20 students let alone 400. We struggle with distractions even with one-to-one learning. In fact as I was going to find this video on YouTube I got distracted and looked at 3 other videos before arriving at this one. (And one of them was a complete sidetrack from the topic I began working on). We are not teaching our students in preparation for the Industrial Revolution. We need to teach proper autonomy in schools that we will use in the workforce. It is so hard to judge flow as instructors sometimes. Maybe they get snagged on a concept and can't get out of it and want to look at it more fully to understand it better. Or the instructor can assume the student was distracted the first time they introduced the idea and scold them for "not paying attention". In the first example the student is in the flow, just wants to do the tutorials one more time for clarification while the second idea the student skipped the tutorials. She didn't understand and then demanded the teacher to go back to the tutorials at the expense of the class who did pay attention to the tutorials. Or perhaps they see one concept and head off on a "relevant" tangent in their mind to supplement the idea brought up. But then again, they may be distracted on an unrelated idea. I remember taking classes in college right after a girlfriend broke up with me and I still remember to this day the exact locations I was sitting at, the teacher's expressions, the class material, and the constant realization throughout the lecture that I was completely lost because my mind couldn't focus. (But thankfully high school and middle school students are more maturity when it comes to their relationships). Needless to say there are a lot of focus issues that take us away from the flow even in the work force. I need to wrap up this post so I can go watch that 10:00 am March Madness game on my work time! MagisterP, what a great break down! This is just my opinion, but I think that making this a competitive activity would have taken away from the flow. I often hear instructors talk about "gamifying" their courses by added competition; to me, that would make my wits scatter! Mina, I appreciate your description of your process in working with your students in Second Life! I've worked with students in SL before and sometimes it works and sometimes it doesn't. The biggest problem I've had is in crowd control (getting everyone to the same place at the same time) and keeping everyone focused (a challenge in SL!). I agree, autonomy and the ability to choose helps students get invested. Great screenshot, by the way! It sounds like what most of you are saying is that while we can encourage flow, we can't predict it. We need to add cues that can help it along (like Taselian mentioned). Grasshopper98's post also helped me realize that having one thing for several students to focus on can help, too. Some of the times I've observed the most flow is when students are actively discussing something away from their computers (I teach computer applications and graphic design). And Sam G, "She didn't understand and then demanded the teacher to go back to the tutorials at the expense of the class who did pay attention to the tutorials. " This is frustrating. I can minimize this but it still happens. Talk about being jarred out of a flow! I think that one thing that is shown by the posts is that everyone "flows" at a different rate & with different things (kind of when you differentiate for different kind of learners) the biggest challenge is finding a way for everyone to flow together. I've dealt with the crowd control issue by breaking the class up into groups (by roles, in this case) and assigning each group to a different island. That island is their home island, so they know to always go there first. If we are going to visit another island, I share the landmark with them once they arrive at the their home island. Focus is not so easily addressed and I've learned not to worry too much about it. I view hanging out in SL as easy fun, so if they get off track occasionally or goof off a bit, I'm okay with it as long as they spend some time discussing their "cases." They are, after all, supposed to be role playing real people and real people are easily distracted from "real work." I recognize that for many students, VR environments like SL have only ever been used for the social experience, so it takes some adjusting for them to learn how to use them for serious behaviors. And old habits die hard. So that makes me worry about fully integrating gaming into a class (to the point that the class itself becomes a game). Will students take it seriously enough? Will they assume that if they're having fun, they're not learning? Or that I don't take the class seriously? I'm always amazed at many of my college students expect school to be serious, difficult, boring, and lecture- and test-based, and how many get upset if a class doesn't fit those expectations. I'm having a bit of a problem with the loose way we seem to be using the concept of "flow". Csíkszentmihályi was clear that the flow state occurs when a person's high level of skill is matched to a high level of challenge. In my understanding and experience, flow does not happen very often to very many people. In fact, I'm not sure that I've ever experienced flow personally. I have been engaged, engrossed, and had my attention focused...but these are not the same as being in a flow state. I actually think that videogames offer one of the most reliable paths to achieving a flow state for a large number of people. Digital games adjust to each player's skill level and constantly provide just the right amount of challenge to keep the player striving and succeeding, thus increasing their skill level through hours of practice. In the world outside of such games, it's harder for people to get the many hours of practice at something that is needed before they are skilled enough to find themselves in a state of flow. It seems an impossibility that a teacher could bring an entire class into a flow state simultaneously. Focus everyone's attention? Yes. Have them rapt with an engaging story? Yes. Motivate them to grapple with a meaningful challenge? Yes. However, imho, the flow state is something that we educators can hold as a goal for our students as individuals, but not as a class. 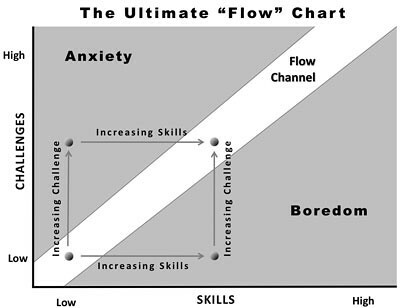 So, how to encourage students to achieve a state of flow? Make sure they have lots and lots of opportunities to have fun working hard for eventual success. Many hours of playful and personally meaningful practice will build up students' skill levels so that they can achieve a state of flow in the practiced activity. @grasshopper98 From all of my research on using SL in the classroom, everyone seems to agree that it has to be fully integrated and used as much as possible and for as long as possible in order for students (and the teacher) to get the maximum results. I dedicated an entire week of class to orienting students to it (none of them had used it before) and we used a Google spreadsheet for students to keep track of each other's display names. And we use it at least once a week (most of the time more). It is a time- and labor-intensive tool. I'm having a bit of a problem with the loose way we seem to be using the concept of "flow". Csíkszentmihályi was clear that the flow state occurs when a person's high level of skill is matched to a high level of challenge. While the conversation might have been a little loose I don't necessarily agree that it is as difficult to get into either. As I look at the 2nd graphic I wager you have been in the flow quite often, just maybe not to a peak or climax. It is really hard to pull someone out of an area the more they head into it. I find times that it is easier to put something down, and other times I am up until 4 in the morning engrossed in what I am trying to accomplish. Therefore, the more you head into the flow the harder it is to pull you out, and same goes with boredom, apathy, worry, anxiety, stimulation, control and relaxation.